If the concept behind zombies, and their permeation into popular culture, fascinate you, yet wrestling does not, would the WWE Zombies line of action figures be a good launching point into better appreciating the hobby? Maybe not in terms of suddenly becoming interested in wrestling. Just gaining more of an appreciation. I started with Dwayne Johnson because he’s about as good a candidate as any to test those waters having long broken free from being strictly shackled to wrestling as The Rock. The base figure looks anatomically correct, particularly in the elongated trapezius muscles between the neck and shoulders. There are only minimal additions to turn it into a “zombie,” including a redesigned head with subtly degraded facial muscles and an implied exposed brain, along with exaggerated skin tears on the right arm. Further zombification, such as skin tears in place of the left tattoo, could have made this really pop, because it looks like a cheap underwhelming gimmick without any customization. The paint accuracy is sloppy, which could be justified with the overall aesthetic. It’s really just the original figure repainted with a single zombie flesh tone, which looks cheap. The zombie effects are decent, with the minimally sculpted exposed brain being the highlight: painted with dark pink for the brain, brushed over with black paint to make it grittier, then outlined with a dark border. A second pass with black paint for additional texture could have made a significant difference. Using this cheap series of wrestling figures as the base for this series was a mistake. The hindered leg movement makes it feel like an articulated statue. A modeling pose is the best standing pose I could find and the leading photograph was the closest I could pose it to The Thinker. The limited breaking points might work well for kids roughhousing these toys, although the lack of versatility is discouraging for those looking for additional action figure photography subjects. I also bought The Undertaker, heavily discounted, and both could work as photography subjects in fights with MOTUC, Marvel Legends, and other similarly scaled six inch series characters. Just don’t expect anything dynamic with their limited articulation. 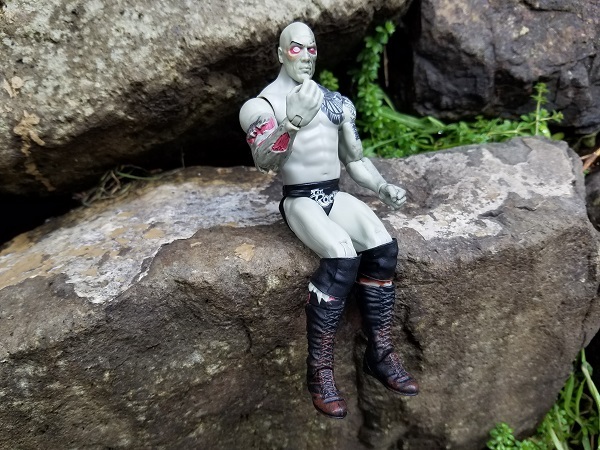 While I don’t own other similar wrestling action figures, I passed on a regular version of The Rock, because it and others I’ve seen looked just as cheap. The WWE Elite series might be more comparable in terms of articulation and build quality. Half of these characters ended up on clearance racks. Maybe the wrestlers weren’t popular? Or zombies aren’t that marketable? I think it’s because everything feels cheap. Basic action figures with minor tweaks don’t command much respect. There is a second series in production, so maybe there will be more effort put into making this series really shine, like the WWE Mutants? I might customize these two, maybe check out an Elite series character, although honestly it’ll probably be a while. Recommended for: Big fans of wrestling only.